Yesterday, on my way back from a neighbor's house, I spotted a child of about 8 years enter a car and slam the door behind him. The windows were tinted, but I saw that he was alone in the car, and kind of just exploring the seats and playing with the steering wheel. I turned to the woman next to me, and basically said that if I didn't check it out I'd be worried that the nightly news would have some tragic story about a little boy who suffocated in a car on 6th Avenue. So, I went back to the car and asked the boy if he was okay. Nods head. Can you open the door? Shakes head. (Smart, considering I am unknown to him.) I tried the door, and it was locked. He had keys in his hand. I stopped a man who had come out of the house next door to the car and asked him if he knew the car or the boy inside. He started talking to the boy by name and asked him to open up. Nope. So he knocked on a house and talked to the kids that came out, asking them to get their parent. I thanked him and left. Hopefully, I did enough. It was Noon, and the windows were all closed tight. The stories about kids who are left in cars or fall asleep after playing in cars are too, too sad. I've often complained about park-goers garbage habits, and after seeing this morning's showing of corn cobs, stink bombs, plastic uzis, confetti poppers, silly string, rum bottles, whole wheat bread wrappers, and other general trash items in the playground this morning, who could blame me? (Sorry about the lack of photographic evidence; my camera has finally and completely died. I did manage to salvage one trash can photo.) Not to mention that the one, lonely Parks worker was provided with an old school metallic rake to clean up the mess. The one trash receptacle was piled high, and its sides showed ample evidence of the "Can't fit it into the trash bin, so I'll just throw it near the trash bin" attitude. Most of the trash was food related despite vending or eating being discouraged in the playground area. My first response was something along the lines of "People can be so disgusting and irresponsible and lazy and rude and inconsiderate." While I still think all those things, I also have to give some responsibility to the Parks Department. My understanding is that there aren't any clean-up crews over the weekends, but there are (minimal) workers for the park in general. 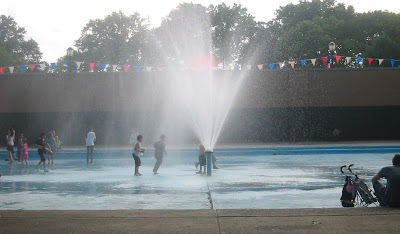 Considering that Sunset Park is well-utilized every day of the week, but especially on the weekends, and considering that it houses one of the two public outdoor swimming pools in Brooklyn, the Parks Department needs to provide much more than the current inadequate maintenance and hygiene within the park. What can we, as residents of Sunset Park, do? 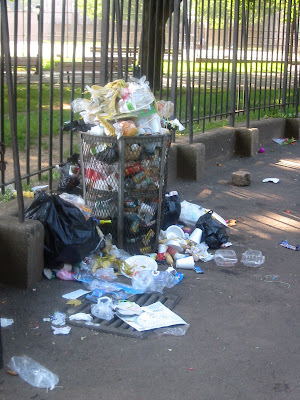 One area that I am guilty of neglecting is being pro-active about refuse around the park. While I will pick up broken glass on the sidewalk, razors in the dirt, and large bottles of Dominican Ron, I haven't confronted litterbugs (except under my breath) unless it's been an egregious example in the playground. I don't usually close the gates to the playground when I enter or exit. I haven't called 311 to report the repulsive condition of the playground (and I wasn't alone in thinking so, really! In fact, it was a caregiver to one of my son's friends who started the conversation). And I know there are other things I could do - I just can't think of them right now. Feel free to chime in. It basically comes down to culture, not ethnicity or race or country of origin culture. The culture of not getting involved and not feeling ownership of the park. When parents don't take responsibility for their children's actions (whether it's silly string all over the slides or squirting complete strangers with a water gun), and when park goers don't respect other people's right to use the park safely and cleanly as well, we end up with destruction and trash and other unenviable results. Basically, I want to feel comfortable using my park. Today's trashy-showing was probably the worst I've seen in many years. (Again, I'm not alone in this observation. Another neighbor said this before I did. Really!) I know that one of the factors is numbers; the playground already had at least 30 kids (plus another 30 adults in various poses) by 8:30 this morning. The park was also jumping with activity at that early hour. However, close quarters does not excuse dirty and dangerous behavior; it should encourage us to be even more careful about our waste. I'm going to try and be more pro-active. Hopefully I won't feel like a complete dufus all alone. I mean, more so than I usually do. While Saturday's opening of the pool had some let-downs (threat of thunderstorms and the lightning that comes with it), Sunday was perfect. The sprinklers were on (although the sprinkler in the playground was not, happily), and the pool seemed well-utilized. The parade of pool-goers on the way to and from the subway station has begun! How was it? Did anyone check out the pool and love it? Hate it? Lap swims start July 6th- 7-8:30 in the AM and PM. Thanks to kittylittered (who has a fantastic photoblog - New York Portraits) on flickr for uploading this to the Best View in Brooklyn photo pool. The sky was amazing. So were the itsy bitsy pieces of hail that fell from the heavens. Our State Senator, Eric Adams, is annoyed with Governor Paterson for calling special sessions. In a June 25, 2009 NYT City Room article, Adams is reported to show up to demand the governor's signature. Two Democrats, Hiram Monserrate of Queens and Eric Adams of Brooklyn, arrived at the governor’s offices after lunch to demand that Mr. Paterson sign into law bills that the Democrats passed during Tuesday’s disputed special session, a move the governor has been unwilling to make because he fears the laws will be challenged in court. Mr. Monserrate and Mr. Adams sharply criticized the governor for blaming the impasse on the Senate and suggested that if Mr. Paterson believed he had been right to call the special session, he should sign the bills into law. ...we embrace the Governor’s call for a special session and support his choice of Justice Lippman to act as Presiding Officer. We also appreciate the willingness of former Lt. Governor Stan Lundine and former State Senator John Dunne to aid in negotiations. Join curator Andy Urban and tour guide Dave Madden for an informative walk through Brooklyn's Chinatown. The walk is in conjunction with the exhibit, "Living and Learning: Chinese Immigration, Restriction & Community in Brooklyn, 1850 to Present." Saturday, June 27. 2-4 p.m. Free. Meet at 36th Street and 4th Avenue (SE corner near entrance to 36th St subway station). atardece sobre NY Harbor, originally uploaded by меr. The next SPAN meeting will take place this Sunday evening June 28th. Included will be a new members' orientation/introduction to SPAN. Amina at Rosita_11215@yahoo.com for exact time and location. TACOS, originally uploaded by veesvision. 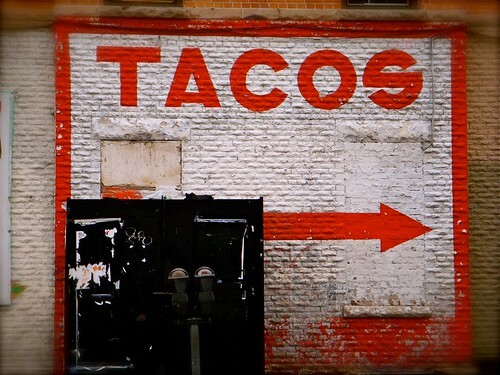 Just follow the arrow to lunch. 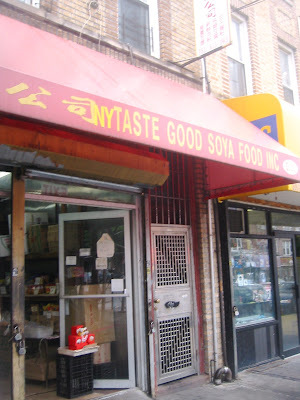 It's not for everyone, I know, but if you like fresh tofu, stop by the shop on 8th Avenue and 51st Street. For $1 you get a container of fresh tofu with or without some honey to add. It's yummy either way. She keeps it in the rice cooker on right side. You can also get a small bag of pre-fried tofu (five large pieces for a dollar) that is scrumptious dipped in carrot-ginger dressing. Take a peek at some of the other items they have displayed while you're at it. Let me know what else is good. Torched, stripped, and now smashed. Whoever did this to this car last weekend was pretty careful about cracking up every single window. Only the windshield wasn't completely smashed in. 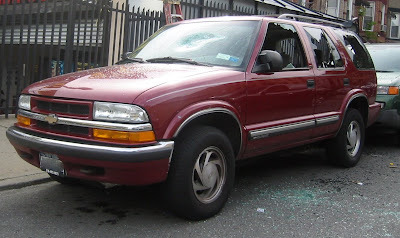 The back window sprayed glass all over the car behind it, but that car wasn't touched otherwise. Thankfully for the car owner, he parked right outside the car wash/car repair place on 4th Avenue. What luck! In a review with a title that begins "Vegetarian Delights of NYC" - you'd think there would actually be vegetarian delights. In fact, it should have read "Vegetable Delights in Chicken or Seafood Broth of NYC." But whatever. When vegetarians go to any restaurant on 5th or 8th (or somewhere in between), they know that any vegetable dish is fair game for animal bits and broth. Places this has happened to me: Nyonya, Mai Thai, Matamoros, several bakeries, and Flor de Piaxtla. Robert Sietsema has made several visits to Sunset Park's Delights, and he has featured them in The Voice. This latest review is for East Harbor Seafood Palace (you can get the menu from that link) on 65th and 7th Avenue. At newcomer East Harbor, some of the more interesting dishes fall in the Vegetable category, though beware strict vegetarians that some recipes may deploy a light chicken or seafood broth. School's out for summer. Not officially, yet, but in effect. Just because the kids are 12 years old (give or take a few years) doesn't mean they should get away with assault and vandalism. Tuesday afternoon a large group of tween/teen boys were throwing glass bottles around the park and onto the sidewalks around the park (both in and out of the actual park). They also assaulted at least one young man - four on one and against the fence. In one case, the glass bottles they through down onto the 44th Street sidewalk (from the park) landed on and around a family walking up the hill. I'm sure some people will disagree that 911 should be called, but I don't. Especially considering the damage a flying glass bottle can do. Since becoming a parent of two, I've been slipping on the housing issues in the area. And because I was never particularly crusader-like to begin with (nor was/am I especially knowledgeable about permits and zoning), that means my occasional calling out on developers has slowed to a trickle. Luckily, Sunset Park Matters has photos and vivid commentary about a couple of my pet peeves in the area. One is the new hotel (?) going up and up and up on 39th and 5th. The other is the dead brownstone turned multi-unit/commercial building on 6th Avenue. They are far from unique right now. Building is booming. The blog asks for residents to document and send in examples of irresponsible development. I'm not a fan of the strategies sometimes used in the postings and response to commenters; I think it turns more residents off than enrolls them in the issue. But I don't need to like it, I just need to read it and research what's said and respond to it. Besides, we need bullhorns these days to help us pay attention to issues around us. Check out the site. During a brief conversation with a couple of other parents this AM, I realized that I just wasn't sure when the pool actually opened. I thought it was the first week in July, but it's actually THIS weekend. Don't forget that the pools have pretty strict rules about what you can wear/bring with you. If the weather cooperates, and if this year is anything like last year, you may want to avoid the first few days if you are bringing little ones. The AM session is a lot less crowded than the PM session. And after a week or so, if you get there right at 11 AM, you have 30-45 minutes before it starts getting active. All 54 Parks outdoor pools have closed for the season and will reopen on June 27, 2009. Indoor pools remain open year-round. General hours of operation are 11:00 a.m. to 3:00 p.m., and 4:00 p.m. to 7:00 p.m. Call individual pools for more specific information. off-leash with a view, originally uploaded by bestviewinbrooklyn. Or at least the application for their sidewalk cafe is up for discussion at the CB 7 Economic Development Committee meeting. If you love the idea or hate the idea, the meeting is at 4th Avenue and 43rd (entrance on 43rd) at 6:30 PM. Department of Consumer Affairs Application for an unenclosed sidewalk café with 9 tables and 18 seats for Mai Thai Thai Kitchen Corp. (License #1318457) located at 4618 8th Avenue, Brooklyn, N.Y.
El Pequeno Artista is running a SUPER sale! all art projects, cooking, dance and music, excursions and one snack a day! ALL in a Spanish Immersion environment. And you pay only $400!! That is $100 off per week! Our unique summer immersion program is carefully designed for children aged 4 to 7, and it runs from 9 to 3pm. There is an optional after camp care service from 3 to 6 (for a nominal fee.) We don't hire teenagers - all of our staff is experienced, professional and perfectly bilingual. LIMITED AVAILABILITY - CONTACT US NOW! It's rain or shine, and it starts at Noon on June 27th. Head down to the 58th Street Pier on 1st Avenue for lots of music and good times. PANADERIA Conchas, originally uploaded by veesvision. Sorry, had to do it. Two "what you see" photos in a row. 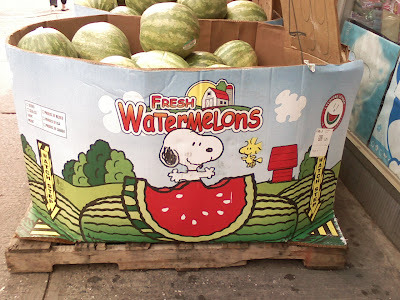 These look much more appetizing (to me, anyway). Check out the BViB photo pool for more photos from the panaderia that made these. Thanks Vanessa! Thanks to Emily for sending this in. 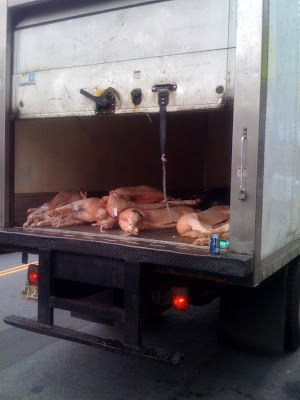 I know that this happens all over, and I know that what we don't see about how our food is treated is much worse. (See Food, Inc.) What I like about this photo, however, is the presence of Sprite cans relaxing on the truck with the pigs. Lovely splash of color, don't you think? 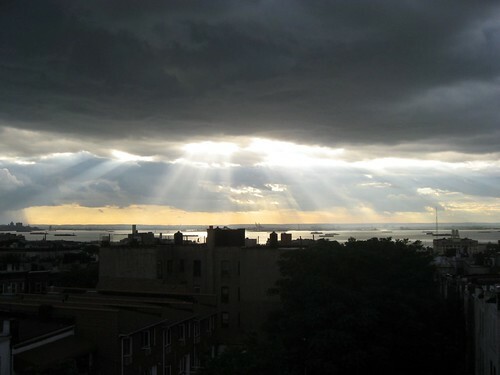 Thanks to Lauren Jaded for adding this to the Best View in Brooklyn Photo Pool. It makes what's outside seem a tiny bit closer to summer. It's a worthy cause (and timely, considering summer is now upon us!). Right now there is a matching donation gift going on ($10=$20, and so on). Even a minor donation goes a ways to helping a kid get a couple of weeks out of the City. And c'mon, don't we all need a week or two out of the City during the summer? Check out the website for more information on how to give. The Brooklyn Before Now posting on Thursday includes a photo of Sunset Park residents (I think it's on 5th Avenue and 44th) marching against crack. It's a photo that demonstrates just a touch of what many Sunset Park residents went through to better a community they loved. That's the part of the wonderful posting that relates directly to our fair neighborhood. The gist of the entry provides information about an exhibit going on right now at the Grand Army Plaza location of the Brooklyn Public Library. Considering that we are living through the seeming disintegration of print media, visiting this exhibit might help us to remember why newspapers were (are?) so much more whole than on-line news sources. Without digital cameras or the ability to change/delete/revise even after publishing, a certain ownership of what it presented to the public reigns. Now there seems to be a lust to just rush to be first, and forget about being the best. Even the requirement of old that a reporter stay neutral has evaporated. I suppose scandals in reporting by folks like Stephen Glass and Jayson Blair didn't help. But I digress. Check out the collection of photographs and other reminders of the reporting and photo-journalism that came out of The Prospect Press. “Images From the Prospect Press” will be on display at the Brooklyn Collection of the Central Branch of the Brooklyn Public Library, Grand Army Plaza, through August 29, 2009. It is free and open to the public. Check http://www.brooklynpubliclibrary.org/ for the Brooklyn Collection’s hours. In a post from a couple of days ago, Lost City details some history about McGovern Weir as well as some current impressions. Check it out. Postponed until July 11th due to inclement weather. I'm sure that games like Dominoes, Go Fish, Boggle, and Uno are also welcome. Does anyone have a Don't Break the Ice? Or Rock 'Em Sock 'Em? They were always good for getting out some aggression. 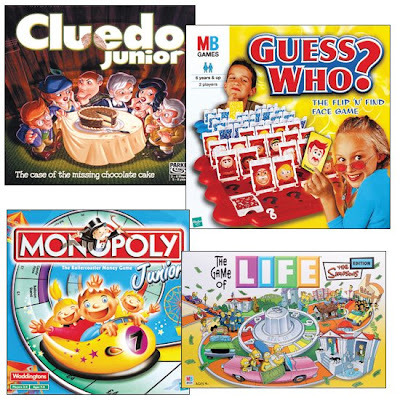 We are seeking donations of gently used board games for ages 8-teen for the Center for Family Life Neighborhood Center program at PS1, which is a sports, art and recreation program for youth 8-16 years old, open to the community. If you have games that you or your children have out-grown, we would love to take them off your hands and put them to great use. If you would like to donate some games, please bring them to the Center for Family Life, 345 43rd Street, Mon-Fri 8am-10pm or Sat 9am-5pm. We welcome you and your children to join us this summer at PS1 Neighborhood Center in the school yard on 47th Street for some games and activities. Starting July 7th, we are open Monday-Friday 1-7pm. 2009 May 341, originally uploaded by junebug622. 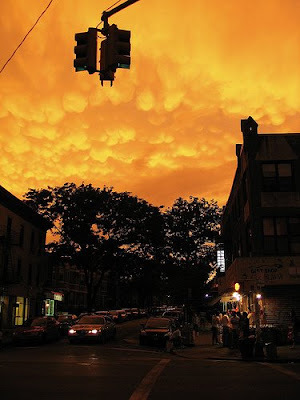 Junebug622 has a fantastic set of photos of Sunset Park. 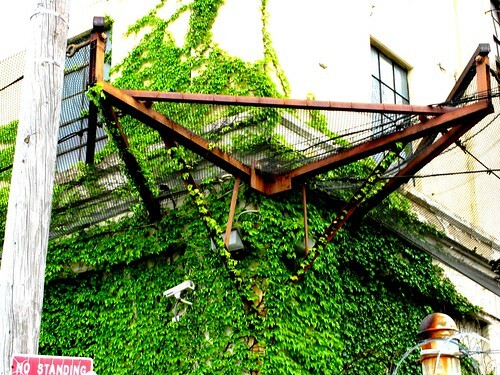 The set includes photos like this one (love the security camera peeking out of the greenery), as well as fantastic photos of various views, industrial geometry, and two close-ups that I can't figure out. I never was good at those "what is this" magnification puzzles. I'm far too literal. 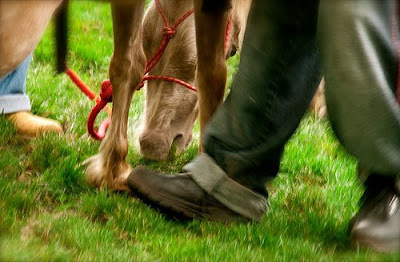 Click on this image to check out more of the photographic artwork. 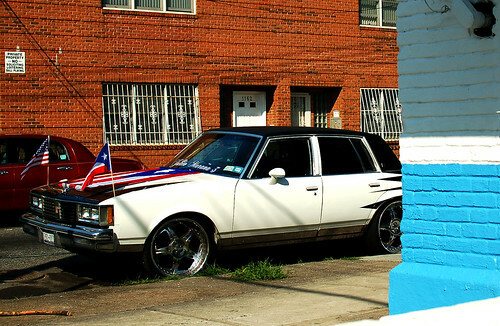 What You See in Sunset Park: Bling! Gold Fronts Are For The Kids., originally uploaded by veesvision. Between the teeth and the tattoos, you can be "all that" in Sunset Park. Thanks to Vanessa at veesvision for the photo. Kids like Museums, too. Some Museums like Strollers. Those who live here don't need to conjure up the image of lots of strollers. Just go down to 5th Avenue any weekend day or weekday afternoon, and you'll see all sizes, colors, and styles rolling about. 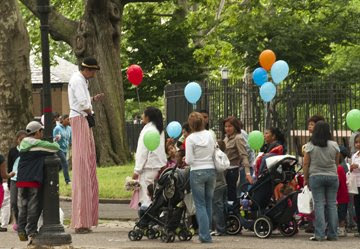 Sunset Park's stroller parade doesn't get as much press as our friendly neighbor to the northeast-ish because it's not as cool to poke fun at and deride people who aren't perceived as privileged. In fact, I think the stroller-mom-hating that used to be pervasive seems to have waned. That, or I have just stopped paying attention because it's so repetitive, silly, and boring. Anyway, Mommy Poppins, the Manhattan-centric parenting site, has a useful list of museums around NYC that allow, limit, and/or shun strollers. 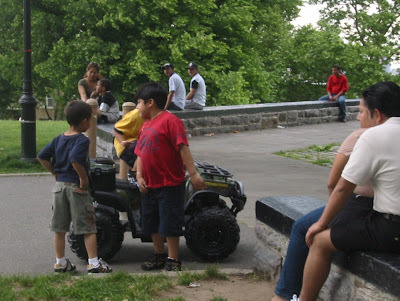 It's not a Sunset Park link, admittedly, but since there are tons of kids in the area (and always have been), I figured some people might appreciate the information. My advice: choose off-hours to bring your kids. No matter how polite or deferential you attempt to be (and with kids in a museum that doesn't have the word children or natural in the name begs parents to be polite in the extreme), children will be annoying to SOMEone. (So will many other people, but that's a different issue.) That's not to say we shouldn't bring off-spring to museums; that's part of what makes NYC so amazing for children. But be real and be fair to other patrons. A crowded museum isn't fun no matter who you are with or without. Isn't MoMA horrific on the weekends? Ugh. Even the under-patronized Brooklyn Museum is best when it first opens, especially on the weekends. The American floor is great, what with the historical houses and comfy seating. One of my favorite paintings is The Shepherdess of Rolleboise, by Daniel Ridgway Knight. On one trip to the Brooklyn Museum (when The Dinner Party first arrived as a temporary installation) with my students, a group came running up to me very excitedly. They babbled on about how there was a painting of me in the museum. Sure enough, a light-skinned brunette shepherdess with her hair in a bun was enough to be me. I was flattered. Especially because of the fashion sense portrayed. LOVE the layers. So I saw the Rolie Polie Guacamole post that Under Minerva put up on Twitter, and I got really excited. I love guacamole. I figured they had decided that champagne is nice with art, but guacamole will really bring 'em in. However, going over to the website description of the event proved to be slightly disappointing. But only for a couple of seconds. 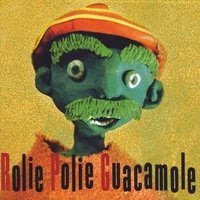 Apparently, Rolie Polie Guacamole is a band that makes music for kids. They are playing at Under Minerva on Saturday at 3 PM. It's $5, but kids 0-2 are free. Check out the details at the website. Wet Ladybug, originally uploaded by veesvision. 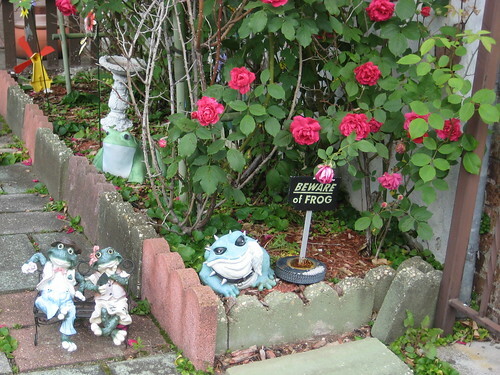 On a day like today, get out and see how many nuggets of loveliness you can find in Sunset Park. Wednesday will be the first visit of the season for The Brooklyn Public Library's Bibliobus. Spanish language books and materials will be available for check-out and perusal. 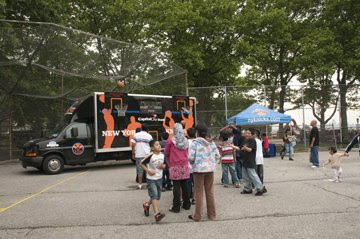 It will be in Sunset Park, at the 6th Avenue and 44th Street entrance, every Wednesday - starting tomorrow at 1:30 PM! 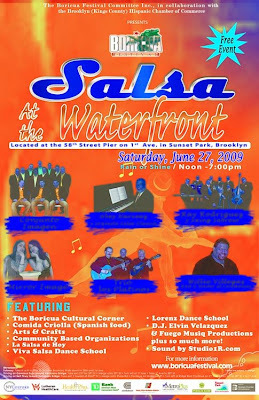 See the Friends of Sunset Park website for more information. This seems like the perfect time to remind everyone that the Brooklyn Public Library really needs some extra help right now. The fund-raising period has been extended through the end of June. Considering how many of us depend on the programs, books, services, classes, and activities offered by the Brooklyn Public Library, can't we spare a few bucks to help out? Support our Shelves Campaign – Extended until June 30th! There is still time to donate to your local library and support your community. The Support our Shelves campaign will help Brooklyn Public Library continue providing books, programs and services to all of our communities. When you contribute, you decide which library to support, and how much to give. So please be shelf-ish! Every donation, from one dollar to a thousand dollars, counts! Since March, individuals, local businesses, corporations and foundations have donated more than $280,202 towards our $300,000 goal! Each donation helps Brooklyn Public Library reach its goal of $300,000 to purchase books, DVDs and support educational and cultural program currently at-risk from large City and State budget cuts. Make a contribution today and show that Brooklyn Public Library is a community priority! When you donate $50 or more, we will send you a bookplate that you can affix to a book of your choosing by seeing the librarian in your local branch. Donate online, or call 718.230.2738. Because all the reasons you use your library are all the reasons to give. If you have any questions please call 718.230.2738 or email supportourshelves@brooklynpubliclibrary.org. The photo doesn't quite do the window display justice, but you get the idea. Lots of support in this window. Dewey Community Mural, originally uploaded by buendiaproductions. June 18th will be the school-wide spring art show at Charles O. Dewey (MS 136). Click on the photo supplied by Buendia Productions for specifics. This Thursday, June 18, MS 136 will be unveiling its Community Mural "WE ARE HERE." This mural was created by students under the direction of Ellie Balk , and in collaboration with Buendia Productions: Mario Barrera (Buendia Art Director) and Daniel Aguilar (Buendia Director, MS136 Journalism Teacher). There will a reception featuring students writing on community, which will be followed by MS 136 Spring Art Show. Swim Season is Coming - Get Informed! A local parent, with patience (the result of necessity!) and perseverance, stayed on the phone to bring us this information about swimming lessons at the Sunset Park pool. Having called the number last year, I can attest to the high frustration-level this call creates. If you want to sign-up your child for lessons, you can either wait in the long, long lines on registration day, or you can take your chances with showing up, or you can show up after the crowds on registration day and get on the waiting list. The Free Beginner Learn to Swim Classes are available Monday-Friday mornings from 8AM-11AM for 2 age groups (1.5 - 5yr olds, 6-14year olds) in 3 sessions. Swim ability of 6-14 year olds is conducted by verbal interview of both parent and child. Tots must be accompanied in water by an adult. Registration is on a 1st come 1st served basis. You must complete a consent form (the message didn't specify but I guess you'd get the consent form at registration) and bring in a copy of the child(ren)'s birth certificate. We've lost plenty of places to rent hikes and belt-tightening, but some hardy souls are actually opening up restaurants around Sunset Park. Here's the newest one that I've noticed. Okay, so maybe it's not a restaurant, but it sure gets rave reviews for its chicken. (disclaimer: I haven't eaten chicken in close to 25 years.) 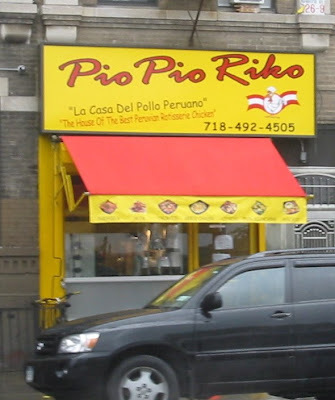 There is a Pio Pio Riko in the Greenpoint area (sorry if I got that wrong, I've always been a South Brooklyn kind of gal), but this seems to be the first one over this way. It's on 4th Avenue and 58th, so that's convenient for the express train. Let's hope it does well. The more storefronts we have filled, the better. Noon: Dance Performance Installation- Kids Workshop! The Sunset-Ridge Waterfront Alliance is pleased to announce our Second Annual Greening the Ridge Festival in 2009! This annual summer festival will bring vendors, agencies, programs, and individuals to the pier for an educational festival on how to green our community. Building upon the success of our First Annual GTR Festival in 2008, this year’s event will bring even more people, and more inter-active booths to the Veteran’s Memorial Pier at 69th Street in Bay Ridge, Brooklyn. In addition, we are unveiling our Green Youth Award Program at this year’s festival, click here for more information! At least in 20 years I'll be able to walk by and point out my "childhood home." It should look the same, since it's in an R6B area. But the community won't be the same, and I probably won't be too interested in meeting the people inside. Are there any neighborhoods in Brooklyn where the neighborhood hasn't changed (much) in 20 years? Sunset is featured in Brokelyn again. I'm sure they'll find a lot to purchase cheaply here as time goes by. Anyway, it's doubly fun because our favorite Sunset photographer (because she sends us fantastic photos of the neighborhood and because she's talented and because she's just cool) has her photos featured on the page. Kudos, Vanessa! I think the photos she most recently sent, particularly the one below are spectacular, and I don't even eat what's on that plate! 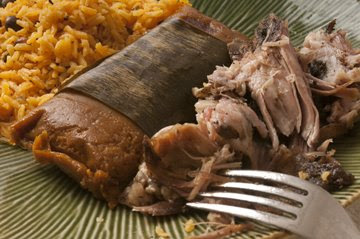 The plate I shot [shown above] consists of pork, rice with pigeon peas, and a specialty dish called "pasteles". I purchased an order of rice, a pound of roast pork, and 2 pasteles. It came out to be $15.00 flat. It fed all of us full with nothing left over. You probably know that *pasteles are made from a root plant like yuca or yautia and plantains and are usually filled with a type of meat. Since this is a "lechonera" (pork restaurant) it was filled with pork. They were very, very delicious! There are interesting family meal deals that I my look into when we are crunched for time. They run about $15-30.00 for everything in a meal for 4-5 people and a liter of Coke. This little guy (yes it's a boy) was found yesterday by a neighbor. 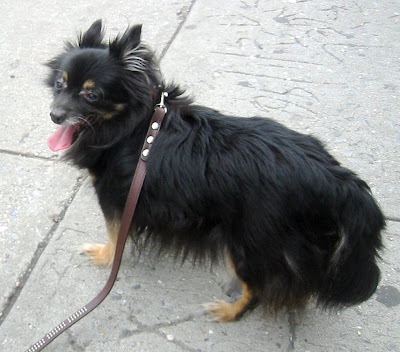 The dog was wandering without collar or other identification on 44th Street by Sunset Park. He was taken (or my neighbor intended to take him) to the NYC Animal Shelter on Linden Blvd in East New York. She said he was older and needed a bath, but other than that, he looked in decent condition. If you know this sweet dog, or if you want to know him, contact the shelter. 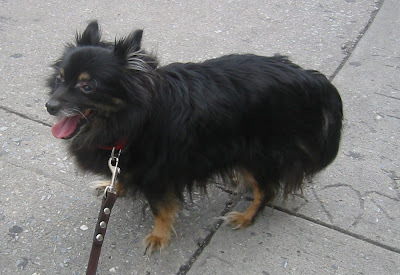 Come share your thoughts about having a dog run in Sunset Park. CB 7 office at 4201 4th Avenue, enter on 43rd Street. 38th Street, Brooklyn NY , originally uploaded by JGNY. The flags are starting to come out of windows. They are also attached to cars. You can buy some paraphernalia on 5th Avenue, both in stores and on the street. Thanks to JGNY for uploading this photo to the Best View in Brooklyn photo pool. The main parade may be in Manhattan, but we get a mini-parade here, too. Check out this link for video that Robert Guskind, the publisher and lifeblood of Gowanus Lounge, took last year. Sunset Park has a lot of talented folks floating around (see sidebar), and now we can add Puzzlemaster to the list. Move over, Will Shortz, here comes another puzzler. The relatively new Puzzling New York blog has puzzles and wordplay of all kinds. I suggest starting out by reading the first puzzle post to read the greetings and explanation, and to try the first trivia puzzle. I've posted some of that first post below. The most important thing that I want to accomplish with this blog is that you, the puzzlers, enjoy the puzzles. Crazy, right? Well, while I am quite proud of the puzzles I have ready and raring to go, this is not about me trying to show you guys how clever I am. It is about creating enjoyable challenges, so feedback is more than greatly appreciated. I may like a certain type of word puzzle that everyone who finds this blog loathes, and I would want to know that and adjust my approach accordingly. One word of warning, however (cue ominous music)… I will try to post challenging puzzles. I like to stretch my brain around difficult wordplay. I do not like the term “dumbed down”, but I am trying to appeal to real puzzleheads here, so there will be some intricate wordplay involved. The answers to the puzzles are in later posts, so if you get up-to-date with the puzzles, you'll actually have to wait for your validation. Check it out and see how well you do without using Google or Bing or Yahoo or whatever search engine you prefer. You can meet Sunset's puzzlemaster on Thursday; he will be a "featured" guest at Rocky Sullivan's Pub Quiz in Red Hook. Always taken with a grain of salt, but interesting nonetheless, here is an email I received from "Sunset Park Matters" about the re-zoning of Sunset Park. Notice that it includes a reminder about the Borough Hall re-zoning hearing on June 10th - this Wednesday! FOR THE SUNSET PARK BLOCK WHERE YOU LIVE OR HAVE YOUR BUSINESS? LOOK-UP THE DETAILS ABOUT EACH DESIGNATION ON THE SAME PAGE AS MAP. PAY CLOSE ATTENTION TO CATEGORIES R6A, R6B, R7A. AFTER YOU CHECK YOUR BLOCK, LOOK AT THE AVENUES. Beware of Frog, originally uploaded by clarabow. Love this. Especially the happy, dancing guys on the side. This year's Brooklyn Anniversary Day had a distinct threat of rain, but that didn't stop lots of Sunset Park kids and parents from enjoying the offerings in the park. Above and below are photographs of Erik's Reptile Edventures. According to Erik, he does a lot of school shows, but he also brings his reptilian pets to birthday parties and other functions (like Family Day). The snakes were very cool; my almost 8 month old got a kick out of petting them. There was also a turtle and frogs. Erik and his lovely assistant were great about letting children and adults handle the snakes respectfully. They also shared nuggets of wisdom. Did you know that when a snake's eyes turn bluish he is getting ready to shed his skin? Cool. Below are some shots from Vanessa of Vee's Vision. 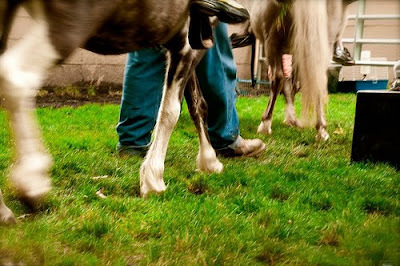 There are the ponies, some sports games that were set up in the courts, and balloon giveaways from Challenge Industries and the Census 2010 people. 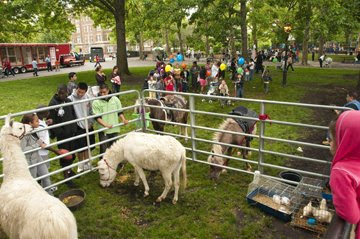 Other attractions included the bouncy rides, cotton candy, a petting zoo, board and tossing games, and face painting. There were also arts and crafts for kids to create. Llama in the City, originally uploaded by veesvision. This is from the Family Day in the Park on Thursday. Thanks to Vanessa at VeesVision for the shots! More photos to follow. On Sunday, at least three families will be hosting stoop sales by the park. 44th Street between 5th and 6th will have lots of baby items (mainly girl, but some boy), knick-knacks, women's and men's clothing, and some household items. Each is starting at about 10 AM, but the ending times vary. Come early to check out the wares. Once you've perused the stoop sale items, continue up past 6th Avenue for some gorditas, pozole, and jamaica. Personally, I think it's the best food within a quick jaunt of the park. informed and ready for the hearing. Invite your neighbors and come out! rent and eliminate small businesses. Sunset Park is Not For Sale! 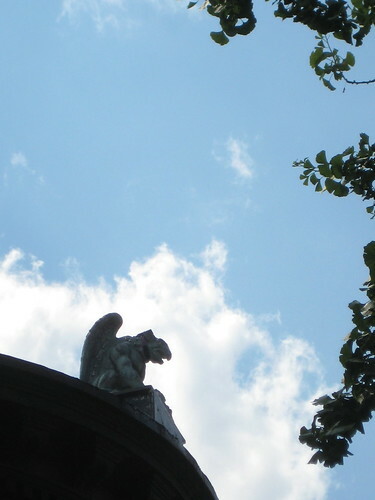 Gargoyle, originally uploaded by clarabow. It's nice to know someone is keeping watch. 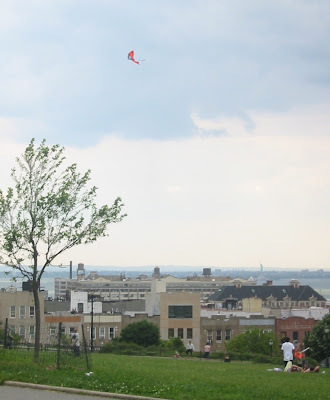 The weather promises it will be another weekend of stunning weekend fun in Sunset Park. 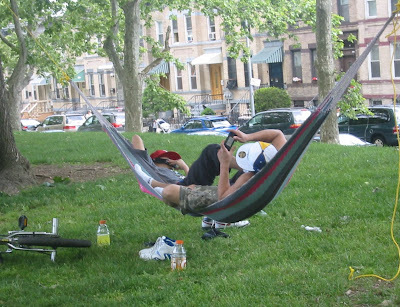 Taken from last weekend's participants,here are some suggestions for park lounging. These photos are in descending order based on their relaxation quotient. The order may change (except for the first two) at any time. String up a hammock and hang out with a friend. Communication with said friend is optional. Communicating with other friends (real or virtual) can and should occur while hanging out with the friend actually beside you. 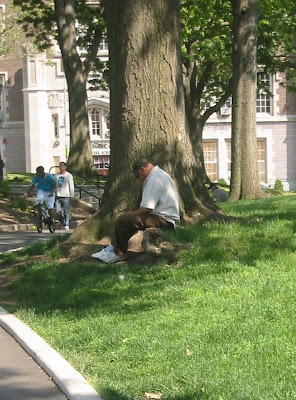 Sit by a tree and meditate, doze, or stare off into space. Occasionally lift your head and waggle eyebrows at passing neighbors. Fly a kite. This is very relaxing if the wind is good. However, it immediately becomes stressful if your kite bonks a nearby family. Wear your running shoes. Form a wagon circle with some friends and chat while playing with children and snacking. This is relaxing for parents of babies and young toddlers and for friends who don't mind young toddlers. Once your children hit two, it's no longer relaxing as they run off at quite a clip. Skate. The goal of these young men was to flip their boards and land with two feet on the board after flying over the "top eight" steps. One kid did it on his first try. Apparently, that's very relaxing since he proved himself early on and didn't have to worry about future success. Play soccer in the wading pool. It didn't look that relaxing to me, but the participants were having a lot of fun. Ride a mini-ATV. This was kind of relaxing for the kids riding it. It was not, however, at all relaxing for those of us walking the same paths as the four-wheeled-monster. One of the boys riding it was acting like a cell-phone-talking-pass-the-too-slow-drivers-with-double-parked-cars-all-around Brooklyn driver. I mean really, he wasn't even looking forward. I know the view is fantastic from the park, but watch where you're going! Under Minerva, on 5th Avenue and 19th Street, is hosting a pretty cool kiddie activity every Saturday in June. And it's free. And they get a juice box. And you can take them walking in Green-Wood afterwards. Check it out. Meet Tony, Under Minerva's Art Director. Learn gallery etiquette, see behind the scenes, and discuss the current exhibition, Making Funny. Get a free juice box and a treasure map to find Minerva in Greenwood Cemetery! Now! It just started! Bring the kids! I know this happens on Brooklyn Day, but I flaked. Sorry! Thankfully, the Friends of Sunset Park are on the ball. I doubt the rain will cancel the events. Get to the park now. See you there. The SP High School situation is different because the building will not be full for the two years the Brooklyn Prospect Charter School is scheduled to be there. However, what happens if two years go by and there is no where else to house the Prospect Charter School? The section referencing Sunset Park is close to the bottom of the article. most disturbing gnome, originally uploaded by clarabow. 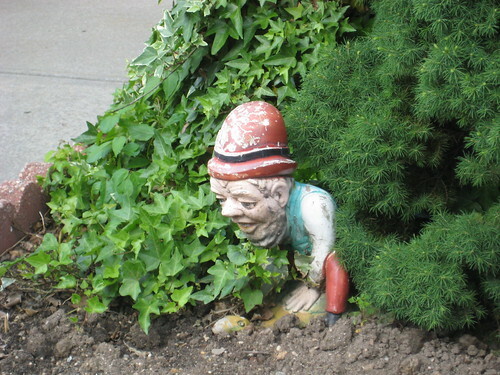 This gnome is hysterical. I know that he may be playing leapfrog, but my sophomoric mind goes to other places. Love Wanted has a lot of events that go on every so often; there is never a shortage of animals in need of a home. This Saturday's event at Salem Church will have a special guest: Joel Silverman of Animal Planet's Good Dog U. I've never seen it, but I'm sure true animal lover's would get cable just to watch. Read more about Silverman and about the event here, thanks to the Brooklyn Eagle. If you are interested, be at Salem Church, 450 67 Street (between 4th and 5th Avenues) on Saturday, June 6, at 11:30 AM. The Friends of Sunset Park site reports that the next re-zoning meeting is coming up very quickly: June 10th. This Wednesday! 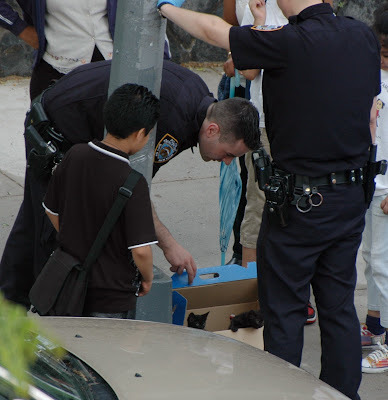 The 72nd Precinct has had a lot of action lately. Between catching bodega robbers with guns, patrolling the park and picking up passed out revelers, checking out the 45th Street station for nefarious behavior, and racing up side streets to address emergency calls, they've certainly got their hands full. And that's just the activity I have heard about in the last 48 hours! If only they'd let in those of us without press credentials to check out the blotter on Tuesdays, I'm sure we'd see much more of their good works. Here's one good deed that took some pressure off the officers. And it helped cement some warm, fuzzy feelings towards our precinct. At least that's the distinct impression I got from watching this drama unfold yesterday afternoon. A group of children and adults stopped to check out a box* left on the side of the road; perhaps they heard sounds coming from the box. Once they peeked inside, they had a short discussion of what to do, and then called either 311 or 911. This group waited by the box for about 15 to 20 minutes until 72nd Precinct officers showed up to assess the situation. See for yourself. * The box was one of those carrying boxes you see kids selling candy from. It had a colorful spaceship motif. If you saw someone carrying this near the Park on Tuesday, that was the kitten-abandoning culprit! 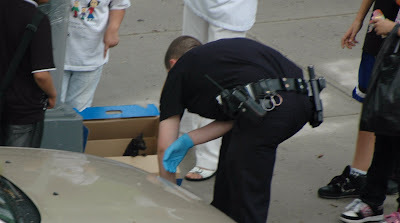 After opening the box, this officer donned blue protective gear to get a closer look. (Not being a cat person, and having allergies to the furry dander beings, I would have too.) One little black kitten poked out his head to check the condition of his surroundings. Another little guy joined his sibling's curiosity. The second officer was more daring; he dove right in without gloves and took a look at the kittens. How cute are these two? Even though I'm not a cat fan, I have to admit I was tempted to take them in. And then I thought better of it. 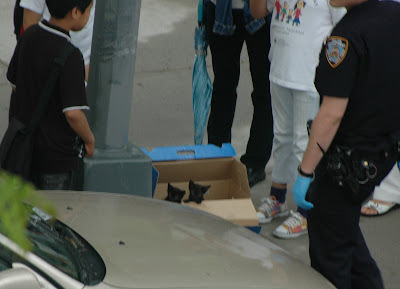 The kittens were loaded up into the police car and driven away. I suppose anyone interested in adopting them could call the precinct at (718) 965-6311 to find out where they went. Otherwise, go to the Love Wanted event in Bay Ridge on Saturday. (I think the post goes up tomorrow.) The good news is, they looked in healthy condition. And no one had done this to them. about the proposed Sunset Park Dog Run. There is also a very interesting debate on Brooklynian about the off-leash versus dog run advantages. It's mainly centered on big dogs not being able to get enough exercise in a dog run. From what I understand, the chances of keeping the off-leash policy in Sunset Park if there is a dog run seems minimal. That's definitely part of the debate, I'd say. WEDNESDAY, JUNE 10 at 6:30 PM. 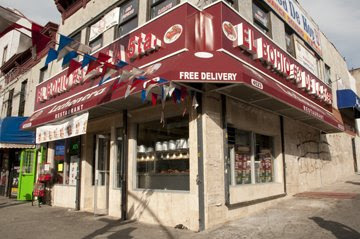 The CB 7 office is at 4201 4th Avenue, but enter on 43rd Street. 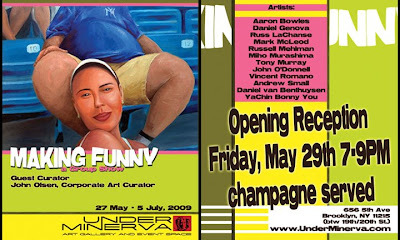 Unfortunately, I was out of town for the opening reception of Making Funny at Under Minerva. There was free champagne from Eurotrip, and you know I like some free champagne. However, the show will be around through the holiday. Independence Day, that is. Under Minerva is pleased to present Making Funny, a group show examining the use of humor in contemporary art. The exhibition brings together various media and methods of utilizing the funny side of life as a vehicle for artistic expression. Historically, humor was often a solecistic tool for the artist; but in our Modern and particularly post-Dada world, humor has become a legitimate means to an artful end. Humor is employed by the show’s artists to take aim at everything from sexual identity, to consumerism, to the art world itself. The show runs the gamut from overt to subtle. Making Funny hopes to bring a little levity to everyone’s life, at a time when we could all use it. Making Funny is the brainchild of guest curator, John Olsen, whose day job as a corporate art curator has him responsible for the art collection of a major financial firm on Wall Street. This exhibition gives him the unique opportunity to play against that role while offering a wonderful assemblage of work to the community.